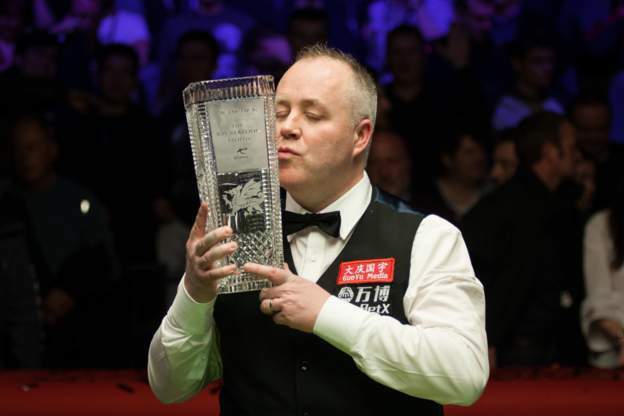 John Higgins was the reigning ManBetX Welsh Open Snooker Champion. Sunday's 2019 final will feature Stuart Bingham v Hossein Vafaei or Neil Robertson. Pic: Getty Images. Cardiff’s Kishan Hirani gave World champion and fellow Welshman Mark Williams a major scare in the ManBetX Welsh Open Snooker Championships at the Motorpoint Arena. Tour rookie Hirani, ranked 122 in the World and playing in his home city, made a 126 break to lead 2-1 before Williams scored breaks of 66 and 80 to lead 3-2 in the best of seven match. Hirani, 28, kept his composure, played some excellent safety shots and impressed with quality long potting to level the score at 3-3. The experienced Williams held his nerve to come through a difficult test and take his place in the second round. “It was a tough game, he made a couple of good breaks and his safety had me in trouble,” said Williams. Mark Williams moved into the second round. Pic: Getty Images. “People were saying it was a foregone conclusion and I was going to win 4-0 or 4-1, but I knew that was a lot of rubbish. I knew it was going to be a difficult game and I could have lost. Cwmbran’s Jak Jones recovered from 2-1 down to defeat fellow Welsh player Matthew Stephens 4-2, while Ryan Day from Pontycymer, Bridgend went out 4-3 against Thailand’s Thepchaiya Un-Nooh. Reigning Welsh Open champion John Higgins eased to a 4-0 win against fellow Scot Graeme Dott, but took his time to find a playing rhythm. Higgins is low on confidence and said: “I could have been back up the road after the first round. I’m not feeling great. “To win 4-0 against a player of Graeme’s quality is great. I grew up with him, he’s a high quality player who doesn’t get recognition he deserves. “My mental state is not great. It’s the worst I have felt as a pro, not wanting to play or practice. But I am working on that. Higgins earned the victory he needed to lift confidence, making breaks of 86, 65 and 51. Ronnie O’Sullivan is in Welsh Open action on Tuesday afternoon..
“Coming back to Cardiff I was trying to think of some good memories I’ve had here,” said Higgins, who has won the Welsh title a record five times. Judd Trump won the World Grand Prix in Cheltenham and immediately switched from Gloucestershire to South Wales. He played Harvey Chandler in the Welsh Open first round with top breaks of 85 and 84. “It was nice to get through so I can have a bit of time off before my next game,” said Trump. “There aren’t many players who win back to back events so I have to be realistic. It is draining mentally to be playing week in, week out, so I’m just going to try to enjoy this event and relax. “It’s a good time to be playing snooker because there is a tournament every week. There are players who have won five ranking events in a season and that’s a goal I want to achieve within the next few years. Ryan Day from Pontycymer, Bridgend. Lukas Kleckers from Germany won 4-0 against Ebdon, top scoring with a break of 52, while Switzerland’s Alexander Ursenbacher defeated Yan Bingtao 4-2. Irish veteran Ken Doherty, who has won the Welsh Open twice, scored a 4-1 victory over Sean O’Sullivan. Eight players scored century breaks on day one and they were: 140 Liam Highfield; 128 Matthew Sell; 126 Kisham Hirani; 108 Liam Highfield; 104 Sean O’Sullivan; 103 Sam Craigie; 102 Shaun Murphy; 102 Noppon Seenokham. There are eight tables in use at the Motorpoint Arena one the first couple of days, catering for 128 players in the draw. The total prize fund is £366,000 and the winner will receive £70,000 after Sunday’s final.